Insulated from the rapid plunders of modernization by vast jungles and mountain ranges, it is still possible to encounter intact shamanic cultures. For these people, plants which bring about visionary trances are the focal point of spiritual life and tradition. They believe plants are sentient beings, cosmic envoys with integral lessons for humanity. They credit their music and medicine, their ontology and vast horticultural knowledge, to the visions induced by psychedelic cognition. For multitudes of indigenous cultures from Siberia to Africa to North and South America, dismissal of the visionary knowledge brought forth by the world of plants would be akin to madness. Hernan, 46, is a shaman from Pisac, Peru who has been practicing since he was eleven years old, when he took his first drink of San Pedro with his grandfather. He has taught internationally, both in the United States and The Netherlands, as well as in villages throughout the Sacred Valley and Iquitos Amazon regions of Peru. Hernan now works at a healing center an hour outside of Cusco, where he organizes biweekly San Pedro excursions. He would be my guide for three ceremonies spanning the course of one month, each of which, in its own way, brought me into contact with those occult dimensions of psychic reality that are forcefully denied by modern rationalism. More than other psychedelics, San Pedro has been widely used in the Andes for over 3,000 years. Unlike Ayahuasca, which is typically celebrated as a feminine plant entity, San Pedro has a specifically masculine spirit and is often referred to as the “grandfather” of South American plant medicines. 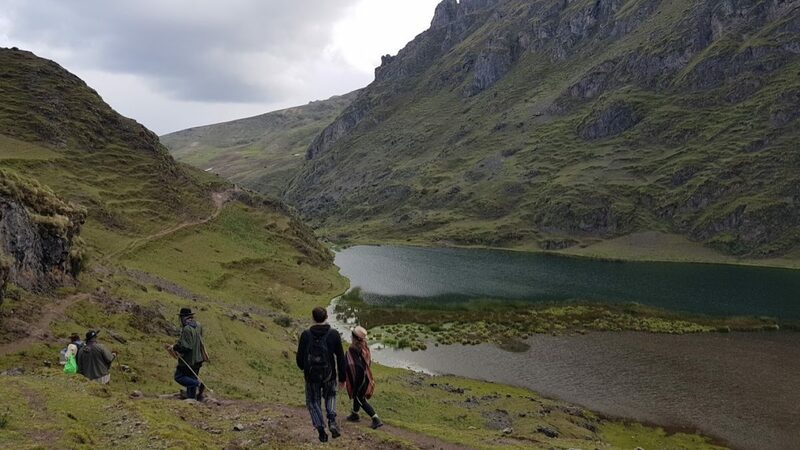 Hernan believes San Pedro can be a valuable tool for the modern Westerner because it imbues a deep sense of connection with the environment and the people around us, and he makes a laudable effort to share this awareness with the people he comes across in Pisac. Hernan’s lineage in the Sacred Valley region dates back at least seven generations. During our final ceremony, for instance, he brought us to the location of his great-grandfather’s house, which had been cheaply maintained for over a century, and then to meet his mother, who had been farming potatoes all day. It was here, eating quinoa soup in a dirt-floored, adobe hut, that I realized something remarkable: for Andean people, the word “Pachamama”—the overarching spirit entity vastly revered throughout indigenous South American cultures—somehow explains the perennial connection these people feel with their land and the ancestors who walked it before them. It would seem, by this logic, that Pachamama (i.e. God) is contained in everything—the mountains they grew up around, the crops they cultivated, the people that surround them, and so forth. My partner and I had never heard of Hernan before we traveled to the Sacred Valley. We had only vague ideas about San Pedro and where we might find it. We arrived late from Cusco on a tight budget and went looking for a place to stay. We needed rest, not a shaman. Hernan’s wife, Katia, offered us a small room for twenty Soles (about $6), which we would end up staying in for a month. We went star gazing on the roof that night, looking out over the cornfields beyond Pisac, and stumbled upon what we had only vague ideas about, but fervently hoped we would find: a row of cacti lining the wall parallel with the street below, each carefully plotted, each at least ten meters tall. Over the coming weeks, we would learn more about Hernan and his family from the locals in Pisac, before taking part in three separate San Pedro ceremonies. We would come to see Hernan as a man of humble wisdom, well-schooled in the art of shamanism and undoubtedly the best man for this kind of experience. After our retreat, I had the opportunity to interview Hernan in Pisac, and he discussed San Pedro tourism, his upbringing and journey to becoming a shaman, and his desire to see his children follow a similar path. How did you become involved in shamanic practice? My grandfather practiced San Pedro shamanism for twenty years, and my father began the path to becoming a teacher when he was just a teenager. I started practicing at age eleven with my grandfather. I have six brothers but I was the only one interested in following this path. My father began a retreat center in Holland, and now the center sends people to me to learn how they can share the lessons of this medicine at home. When did you begin healing people with San Pedro? At age thirteen I began taking people on San Pedro retreats, beginning with only two or three people each month. By the time I was fifteen I was leading retreats with visitors on a regular basis. That was 31 years ago. The aim is to the master the medicine even though it is impossible to master. What makes San Pedro impossible to master? The medicine is powerful. It connects you deeply with the energy in all things—the power of the Andes, the power of ancient spirits, and the power of your own soul. This is not something that can be mastered. When you work with this medicine you become humble, calm, and balanced. How do you prepare your San Pedro? Each plant takes about ten to fifteen years to grow two meters tall. When the cactus is ready for medicinal use, there is a green pulp under the skin where the mescaline is found. First, I peel off the skin, then I carefully remove the mescaline. I cook this in an oven for eight hours or until it is completely dry, then I make it into powder with a grinder. Do you work with more Peruvians or visitors? I work with more visitors than Peruvians, but many locals are beginning to wake up to the power of this medicine. People come when they feel the calling in their heart. Visitors, however, are unique in that they often come to Peru specifically because they feel this calling. Is there something in gringo culture that makes them come here in search of something else, something their culture doesn’t offer? I don’t think I am the right person to answer that, but I often notice that visitors (from predominantly Western countries) cry when they take San Pedro because they seem to recall troubling events from their past. Sometimes people cry all day after taking the medicine, which I think occurs when people have done something they deeply regret. Still, there is no negative aspect associated with San Pedro, even though people can sometimes have difficult experiences because they recall personal traumas. What do people find when they take San Pedro, in your opinion? What healings have you seen from San Pedro ceremonies? The medicine stays with them long after they have taken it. It cleanses and helps them stop negative patterns and habits. One only needs to take San Pedro three times to learn its lessons. The first I call “Initiation,” the second “Processing,” and the third “Finalization.” This is all that is needed for true cleansing. The next step is integrating these lessons into your daily life. They are the songs of my family. Some are mine and some are my grandfathers. I created them through the connection I have with Pachamama—the water, fire, condors, hummingbirds, eagles, and the awareness that the power of nature is what makes the San Pedro grow. The medicine cleanses the heart and soul. The songs arise from this sense of balance and connection. Is the path to becoming a shaman a difficult one and, if so, do you want your kids to become shamans? Do you want your children to lead this life? The path is different for everyone, but for me it is the only path. My wife sometimes asks how long I will continue doing this work, and I tell her it is my destiny. The medicine is still changing me. My sons are following this path too. All of them have taken the medicine, including my youngest, who is nine. My oldest son is currently training to become a shaman, and eventually wants to teach abroad. I am happy about this because I believe this medicine has the power to change the world. Author bio: Nico is a travel writer based in Peru. He holds degrees in English and Political Science from UC Berkeley, and his work has been featured in Z Publishing House’s California’s Emerging Writers series and Santa Barbara’s Independent.